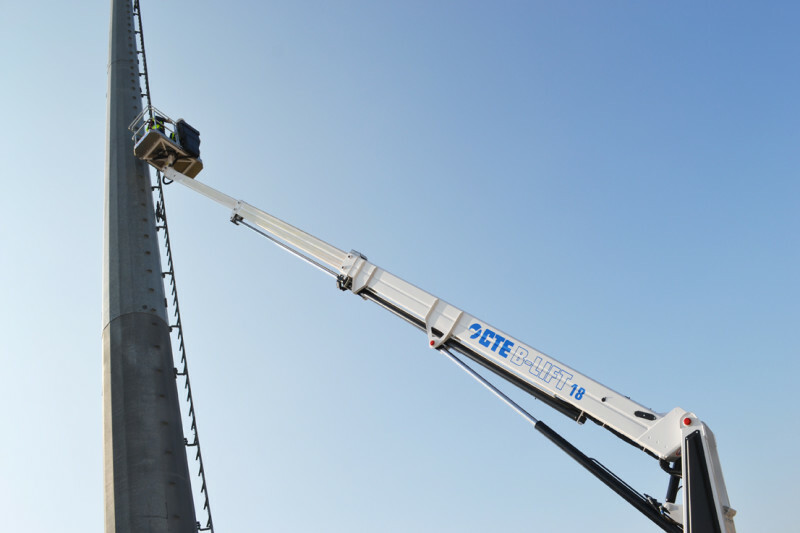 CTE continues in the development of its telescopic truck-mounted range introducing a new 18 m model: CTE B-LIFT 18. It was born as a novelty in the new CTE B-LIFT range that has been redesigned at the beginning of 2017 after the introduction of Euro 6 trucks. In the CTE B-LIFT range, it follows the well-known CTE B-LIFT 17, but it’s higher and is equipped with S3 Smart Stability System. 18m of working height, min 11,8m/max 13m outreach, basket capacity of min 120kg/max 300kg. Operators will recognize this model as the ideal ally for various applications, as from facades works (painting or cleaning facades) to the maintenance of public lighting, from wind power to the installation of advertising signs, from the maintenance of buildings to restoration. S3 Smart Stability System allows also to use the right space on site, thanks to the possibility of extending or not the front stabilizers in infinity positions, and to place the rear stabilizers fixed in shape. It enhances the main features of this model, underlining the truck compactness, the variable stabilization system S3, the telescopic boom stability and the maneuver’s smoothness. The video was shot in the industrial area of Affi (Verona). ►CTE B-LIFT 18 reaches 18 m of working height, 13 m of max outreach and 300 kg of max capacity. Telescopic boom (3 elements: main boom + 2 telescopic extension), 540° turret rotation, smooth proportional controls with acceleration and deceleration ramps, engine start/stop control from the basket and the ground, automatic engine rpm management.